Liesl, S, and I would like to take a few moments to wish all of you and your families the happiest of holiday seasons! We sincerely appreciate all the encouragement you have provided us over the last year. We enjoy what we get to do for work every day, and your support of our small family business allows us to do continue doing that. So thank you. We’re planning to take a little break over the next week and a half to spend time with family and friends. Enjoy your holidays, and we will see you back here on January 5. 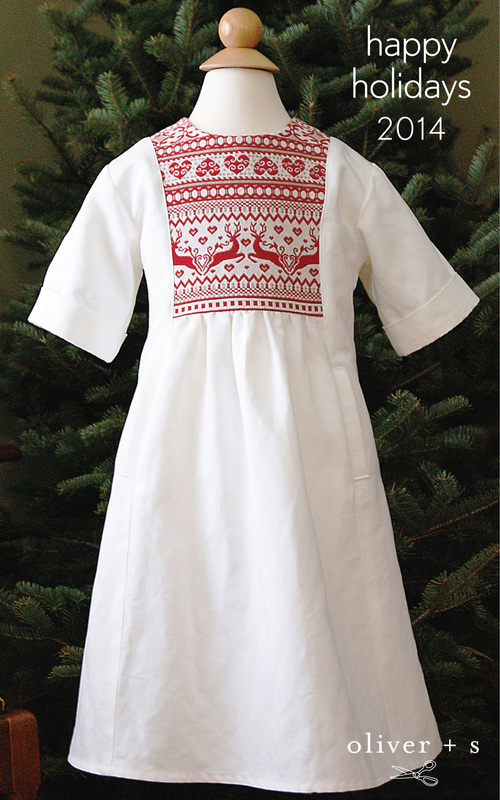 To leave you with some holiday inspiration, take a peek at this Scandinavian Christmas Hide-and-Seek Dress that Rachel (unbenknownst to the rest of us here in the studio!) made for her daughter this holiday season. The dress was inspired by Saint Lucia who wears a white dress with red sash and a crown of green leaves. I bet you would never guess where Rachel found the yoke fabric. But before we sign off for the holidays, we thought we would leave you with a little homework assignment. Start making your 2014 year in review photo mosaics and post them to the Flickr group. Rachel will be doing a round up to highlight your work early in the new year. Merry Christmas! Love the Santa Lucia dress.